The company began life as a domestic metal fabricator in Adelaide in 1948. A move to sink manufacturing saw them pioneer the deep drawing process in Australia. 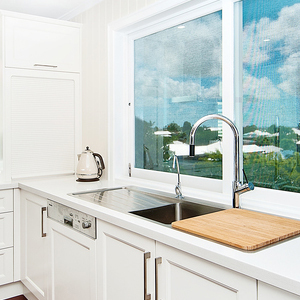 Over the years as the business grew, Oliveri, now Australia's only commercial sink manufacturer, introduced precision technology to their stainless steel sink manufacturing process with the installation of some of the World's most sophisticated processing equipment. Their two piece manufacturing process where the drainer & bowls are pressed separately then welded together ensures that the bowls are deep, straight sided and have maximum capacity. The personal touch is retained with final inspection and packing conducted by experienced quality control staff. The quality style and superior design of Oliveri sinks is now enjoyed by home owners around the World as the brand has become established in many overseas markets. Oliveri's exposure to World markets ensures that product design and functionality is at the forefront so as to be able to compete on the World stage.